Use promo code HOTSEATS while very limited supplies last for 90% off the base fare of a roundtrip, nonstop JetBlue flight from NY’s JFK, LGA or EWR airports on the specified dates. Must depart from and return to JFK, LGA or EWR airports. Must depart from and return to same airport. Roundtrip purchase required. New bookings only. Only a very limited amount of promo codes are available, so grab ‘em while it’s hot! Once they’re gone, well, they’re gone. Discount is not held until your purchase is finalized. 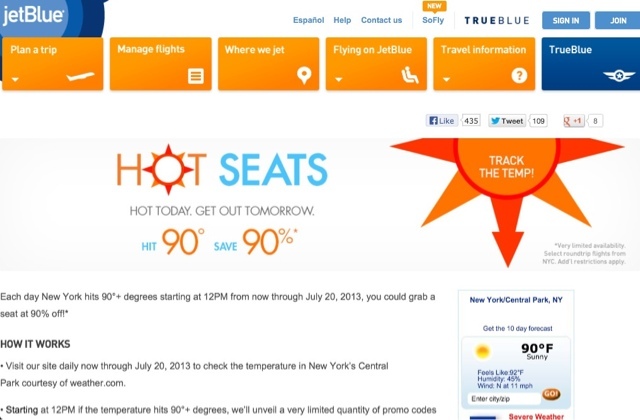 Promo codes are case sensitive and can only be redeemed online while very limited supplies last at jetblue.com/promo. Search flights with specific travel dates listed above (JFK, LGA, or EWR departures only). Both outbound and return dates must fall within indicated travel period in order for the discount to apply. You must select flights in order for discount to appear. Once selected you will see the discount amount displayed in the itinerary subtotal on the flights page. Only one code per reservation.